Four artists will discuss their research projects. This ongoing research project explores the medium of light projection on urban public space as a means to question the oppressive mechanisms and discourses implemented in the city. The work focuses on exploring notions of appropriation, subversion and activation of public space.? ?By actively engaging in experimentation, the research process is carried out through a series of public interventions in different urban conditions. The aim is to explore contemporary issues of identity (personal and collective), communication (expression of the self), and autonomy (moments of antagonism), through the temporary appropriation of public space, whether spatial, temporal, and psychological. By intervening the everyday order of contemporary urban life, these experiments aim at creating moments of antagonism—however transitory, fragmentary and ephemeral these might be. The project aims at finding new ways to practice the city, not simply as consumers but as creators.? ?The research was carried out at the Graduate School of Architecture, Planning and Preservation at Columbia University in New York, through the Advanced Architectural Research 2011-12 program. The aim of the lecture will be to introduce an actual ongoing art-practice-research project in the field of visual art with the working title Keep Frozen. The idea for the project was born already in 2010 and the plan is to finish the research in the year 2014/15. The research topic and the methodology will be explored and the research put in context with the wider literature of art-practice-as-research. The research process has included field research, contemplation and processing of visual research material in the studio, sculpture making, reading, note taking and text based conceptualisation. What makes the lecture interesting is that it will be the first attempt to put this process as a whole into written words. It is a research in process and thus no final research results have appeared. Indeed, the lecture itself and the making of it is part of research. As the lecture is being written the first art objects of the research are being created and shortly after the first public viewing has been organised. The artist works with found objects, sculpture, the single-channel, multi-channel and the documentary video forms and with digital photography. The lecture will be supported by research notes in their various forms. This is a research that is being conducted by an independent artist outside the institutional context and must be viewed as such. The process of art object creation will be uncovered as a research process where the specific and singular methods of art creation are being applied. The lecturer asks the audience whether the art-research needs the official recognition of the art institution to be considered valid (as in parallel fields) or if we could examine art-practice in general as research. 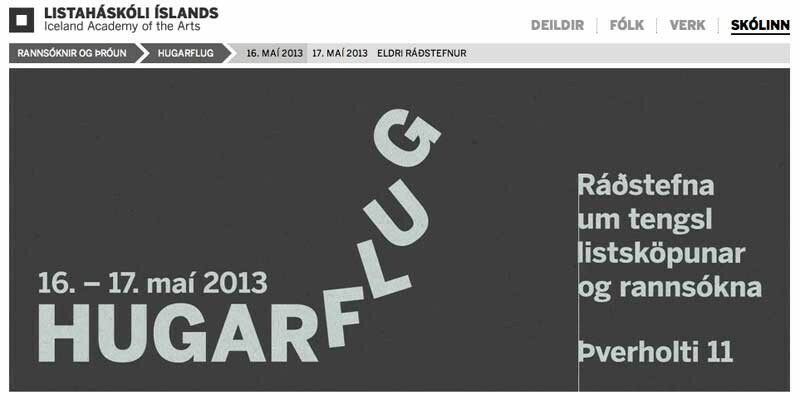 The lecture was written for Hugarflug 2013 and the Waterfront Museum in Brooklyn, NYC. It is written in a language accessible for both professional researchers and others interested in the phenomenon of artistic research. Taking throwaway verbal comments and expanding their logic ad absurdum, I constructed ‘experiments’ in order to test undecidable hypotheses - performative research projects, where I was both researcher and unit of analysis. Such a self-reflexive approach would certainly have no place in contemporary scientific research - the frame of the research itself was fundamentally altering my perception and biography. On the other hand, self-reflexivity is a fundamental tenet of conceptual art practices from the 1960s. Perhaps my work could be classed as an extension of these practices. Then again, self-reflexivity is second nature to the stand-up comedian. After all, autobiography has long been the comic’s raw material, ready to be chiselled into one-liners or comedic ‘bits’. Kauffman or Warhol? Does the research create a comedian or an artist? Perhaps both, perhaps neither. It could be argued that the grandfather of contemporary art Marcel Duchamp, was simply using the art context as a space for comedy. Given that lineage, and the proliferation of practice based PhD's and increased attention to research-based practices in today's art world, does it follow that the buzz term of 'artistic research' is one circuitous, elaborate, expanded, circuitous joke? CIVIC VIRTUE is a collective which has been active in the Netherlands since 2010. The group defines itself as a Neoclassic Revival. Its members draw upon the continually re-emerging symbolism and allegories from the past, which lend themselves to rumination and to the recuperation of virtues. It is an aesthetic experiment positioned at the crux of revolt and revival, renewal and conservation. CIVIC VIRTUE has now finished its ‘Grand Tour’ of Europe and mounted an exhibition by the same name. As the press release states: "As CIVIC VIRTUE returns home to Amsterdam, they bring with them the evidence and insights of their recent coming-of-age journey. Through the digestive tracts of history, they have worked their way down to the forgotten sewers and plumbing of social unconsciousness. These networks and vessels, our collective circuitry of ingesting and digesting, will become the means by which a new Temple of Virtues may be excavated." The presentation ‘CIVIC VIRTUE – Europa as Cow’ will expand upon underlying themes behind 'The Grand Tour' and illuminate a constellation of connections to be found amongst historical fact, European geography, the rumination of cows, 19th century philosophy, mythology, repetition, and mass production in the 20th century.